1980: AGROVOC multilingual thesaurus was started by FAO, in order to provide access to semantic information (concepts, terms, and relations) covering all of FAO's areas of interest including food, nutrition, agriculture, fisheries, forestry, environment and other related topics. Since 2010, AGROVOC has been expressed as a Semantic Web concept scheme using Simple Knowledge Organization System (SKOS). For the past decade, the technical e-infrastructure for AGROVOC has been managed in collaboration with FAO by the Artificial Intelligence Research group, in Tor Vergata University (Rome). AGROVOC content editing is now in VocBench3 (VB3) - an advanced collaboration web environment for maintaining thesauri, ontologies, code lists and authority resources, providing features such as history, validation, a publication workflow, and multi-user management with role-based access control. VB3 supports the multischeme hierarchy approach, i.e. the use of hierarchical relation properties specific to a scheme. VB3 allows that AGROVOC hierarchy is viewed flexibly and edited with its customized relations, or exported with a generic SKOS hierarchy of broader and narrower relations, without changing the hierarchy of AGROVOC itself. popular to index and tag information resources in low-income countries. Browse/Search AGROVOC in a web-based browsing environment SKOSMOS and check which AGROVOC terms/concepts could already be of use and relevant to Your work! Worldwide: CGSpace Repository, International Crops Research Institute for the Semi-Arid Tropics (ICRISAT), International Maize and Wheat Improvement Center (CIMMYT), International Food Policy Research Institute (IFPRI), National Bibliography on Tropical Biology (BINABITROP; search among these public databases), among others. FAO: AGRIS, AGORA, AIMS.FAO.ORG, GODAN Action…, the FAO Website, FAO Country Profiles, FAO Corporate Document Repository, FAO Library Catalog, FAOTERM, FAOLEX database, among others. Reciprocal links (visible in the Linked Open Data Cloud) to other 18 other multilingual knowledge organization systems (vocabularies, thesauri). 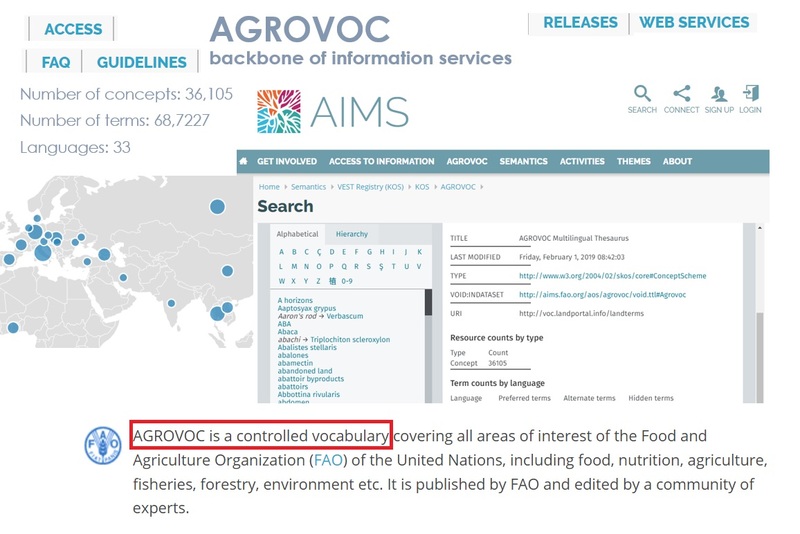 AGROVOC is available for re-use as a Linked Open Data under the international CC-BY IGO 3.0. license. Please send the suggested new concept in English, with any translations available, suggested broader term if possible, and the definition with source (the more information, the better!) to agrovoc@fao.org.